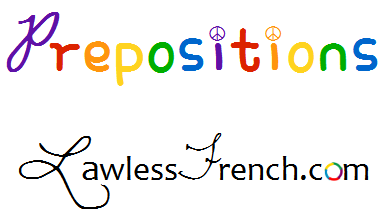 The preposition à is generally summarized as "to, at, or in," but it has quite a few more meanings and uses than that. Nous allons à Nice. We’re going to Nice. Je veux conduire à la poste. I want to drive to the post office. Habitez-vous à Toulouse ? Do you live in Toulouse? Elle est à l’école. She’s at school. Il habite à 20 minutes d’ici. He lives 20 minutes away from here. Elle va arriver à midi. She’ll arrive at noon. J’ai publié mon premier livre à 25 ans. I published my first book at 25. Il me faut 2 à 3 heures pour le faire. I need 2 to 3 hours to do it. C’est à moi. It’s mine. Cet argent est à Michel. This is Michel’s money. Nous n’avons rien à faire. We have nothing to do. Many verbs must be followed by à in front of a noun or infinitive. Some adjectives must be followed by à in front of a noun or infinitive. When à is followed by the definite article le or les, the two words must contract. However, à does not contract with the direct objects le and les. Je me prépare à le faire – I’m getting ready to do it.